"Tarkovsky" redirects here. For the surname, as well as other people with this name, see Tarkovsky (surname). Tarkovsky for me is the greatest (director), the one who invented a new language, true to the nature of film, as it captures life as a reflection, life as a dream. Tarkovsky's films include Ivan's Childhood (1962), Andrei Rublev (1966), Solaris (1972), Mirror (1975), and Stalker (1979). He directed the first five of his seven feature films in the Soviet Union; his last two films, Nostalghia (1983) and The Sacrifice (1986), were produced in Italy and Sweden, respectively. The films Andrei Rublev, Solaris, Mirror, and Stalker are regularly listed among the greatest films of all time. Andrei Tarkovsky was born in the village of Zavrazhye in the Yuryevetsky District of the Ivanovo Industrial Oblast (modern-day Kadyysky District of the Kostroma Oblast, Russia) to the poet and translator Arseny Alexandrovich Tarkovsky, a native of Yelisavetgrad, Kherson Governorate, and Maria Ivanova Vishnyakova, a graduate of the Maxim Gorky Literature Institute who later worked as a corrector; she was born in Moscow in the Dubasov family estate. Andrei's paternal grandfather Aleksandr Karlovich Tarkovsky (in Polish: Aleksander Tarkowski) was a Polish nobleman who worked as a bank clerk. His wife Maria Danilovna Rachkovskaya was a Romanian teacher who arrived from Iași. Andrei's maternal grandmother Vera Nikolaevna Vishnyakova (née Dubasova) belonged to an old Dubasov family of Russian nobility that traces its history back to the 17th century; among her relatives was Admiral Fyodor Dubasov, a fact she had to conceal during the Soviet days. She was married to Ivan Ivanovich Vishnyakov, a native of the Kaluga Governorate who studied law at the Moscow University and served as a judge in Kozelsk. According to the family legend, Tarkovsky's ancestors on his father's side were princes from the Shamkhalate of Tarki, Dagestan, although his sister Marina Tarkovskaya who did a detailed research on their genealogy called it «a myth, even a prank of sorts», stressing that none of the documents confirms this version. Tarkovsky spent his childhood in Yuryevets. He was described by childhood friends as active and popular, having many friends and being typically in the center of action. His father left the family in 1937, subsequently volunteering for the army in 1941. Tarkovsky stayed with his mother, moving with her and his sister Marina to Moscow, where she worked as a proofreader at a printing press. In 1939 Tarkovsky enrolled at the Moscow School No. 554. During the war, the three evacuated to Yuryevets, living with his maternal grandmother. In 1943 the family returned to Moscow. Tarkovsky continued his studies at his old school, where the poet Andrey Voznesensky was one of his classmates. He studied piano at a music school and attended classes at an art school. The family lived on Shchipok Street in the Zamoskvorechye District in Moscow. From November 1947 to spring 1948 he was in the hospital with tuberculosis. Many themes of his childhood—the evacuation, his mother and her two children, the withdrawn father, the time in the hospital—feature prominently in his film Mirror. In his school years, Tarkovsky was a troublemaker and a poor student. He still managed to graduate, and from 1951 to 1952 studied Arabic at the Oriental Institute in Moscow, a branch of the Academy of Sciences of the USSR. Although he already spoke some Arabic and was a successful student in his first semesters, he did not finish his studies and dropped out to work as a prospector for the Academy of Science Institute for Non-Ferrous Metals and Gold. He participated in a year-long research expedition to the river Kureikye near Turukhansk in the Krasnoyarsk Province. During this time in the taiga, Tarkovsky decided to study film. Upon returning from the research expedition in 1954, Tarkovsky applied at the State Institute of Cinematography (VGIK) and was admitted to the film-directing program. He was in the same class as Irma Raush whom he married in April 1957. The early Khrushchev era offered good opportunities for young film directors. Before 1953, annual film production was low and most films were directed by veteran directors. After 1953, more films were produced, many of them by young directors. The Khrushchev Thaw relaxed Soviet social restrictions a bit and permitted a limited influx of European and North American literature, films and music. This allowed Tarkovsky to see films of the Italian neorealists, French New Wave, and of directors such as Kurosawa, Buñuel, Bergman, Bresson, Andrzej Wajda (whose film Ashes and Diamonds influenced Tarkovsky) and Mizoguchi. Tarkovsky's teacher and mentor was Mikhail Romm, who taught many film students who would later become influential film directors. In 1956 Tarkovsky directed his first student short film, The Killers, from a short story of Ernest Hemingway. The short film There Will Be No Leave Today and the screenplay Concentrate followed in 1958 and 1959. An important influence on Tarkovsky was the film director Grigori Chukhrai, who was teaching at the VGIK. Impressed by the talent of his student, Chukhrai offered Tarkovsky a position as assistant director for his film Clear Skies. Tarkovsky initially showed interest but then decided to concentrate on his studies and his own projects. During his third year at the VGIK, Tarkovsky met Andrei Konchalovsky. They found much in common as they liked the same film directors and shared ideas on cinema and films. In 1959 they wrote the script Antarctica – Distant Country, which was later published in the Moskovskij Komsomolets. Tarkovsky submitted the script to Lenfilm, but it was rejected. They were more successful with the script The Steamroller and the Violin, which they sold to Mosfilm. This became Tarkovsky's graduation project, earning him his diploma in 1960 and winning First Prize at the New York Student Film Festival in 1961. Tarkovsky's first feature film was Ivan's Childhood in 1962. He had inherited the film from director Eduard Abalov, who had to abort the project. The film earned Tarkovsky international acclaim and won the Golden Lion award at the Venice Film Festival in the year 1962. In the same year, on 30 September, his first son Arseny (called Senka in Tarkovsky's diaries) Tarkovsky was born. In 1965, he directed the film Andrei Rublev about the life of Andrei Rublev, the fifteenth-century Russian icon painter. Andrei Rublev was not, except for a single screening in Moscow in 1966, immediately released after completion due to problems with Soviet authorities. Tarkovsky had to cut the film several times, resulting in several different versions of varying lengths. The film was widely released in the Soviet Union in a cut version in 1971. He divorced his wife, Irma Raush, in June 1970. In the same year, he married Larissa Kizilova (née Egorkina), who had been a production assistant for the film Andrei Rublev (they had been living together since 1965). Their son, Andrei Andreyevich Tarkovsky, was born in the same year on 7 August. A version of the film was presented at the Cannes Film Festival in 1969 and won the FIPRESCI prize. In 1972, he completed Solaris, an adaptation of the novel Solaris by Stanisław Lem. He had worked on this together with screenwriter Fridrikh Gorenshtein as early as 1968. The film was presented at the Cannes Film Festival, won the Grand Prix Spécial du Jury and the FIPRESCI prize, and was nominated for the Palme d'Or. From 1973 to 1974, he shot the film Mirror, a highly autobiographical and unconventionally structured film drawing on his childhood and incorporating some of his father's poems. In this film Tarkovsky portrayed the plight of childhood affected by war. Tarkovsky had worked on the screenplay for this film since 1967, under the consecutive titles Confession, White day and A white, white day. From the beginning the film was not well received by Soviet authorities due to its content and its perceived elitist nature. Russian authorities placed the film in the "third category," a severely limited distribution, and only allowed it to be shown in third-class cinemas and workers' clubs. Few prints were made and the film-makers received no returns. Third category films also placed the film-makers in danger of being accused of wasting public funds, which could have serious effects on their future productivity. These difficulties are presumed to have made Tarkovsky play with the idea of going abroad and producing a film outside the Soviet film industry. During 1975, Tarkovsky also worked on the screenplay Hoffmanniana, about the German writer and poet E. T. A. Hoffmann. In December 1976, he directed Hamlet, his only stage play, at the Lenkom Theatre in Moscow. The main role was played by Anatoly Solonitsyn, who also acted in several of Tarkovsky's films. At the end of 1978, he also wrote the screenplay Sardor together with the writer Aleksandr Misharin. The last film Tarkovsky completed in the Soviet Union was Stalker, inspired by the novel Roadside Picnic by the brothers Arkady and Boris Strugatsky. Tarkovsky had met the brothers first in 1971 and was in contact with them until his death in 1986. Initially he wanted to shoot a film based on their novel Dead Mountaineer's Hotel and he developed a raw script. Influenced by a discussion with Arkady Strugatsky he changed his plan and began to work on the script based on Roadside Picnic. Work on this film began in 1976. The production was mired in troubles; improper development of the negatives had ruined all the exterior shots. Tarkovsky's relationship with cinematographer Georgy Rerberg deteriorated to the point where he hired Alexander Knyazhinsky as a new first cinematographer. Furthermore, Tarkovsky suffered a heart attack in April 1978, resulting in further delay. The film was completed in 1979 and won the Prize of the Ecumenical Jury at the Cannes Film Festival. In the same year Tarkovsky also began the production of the film The First Day (Russian: Первый День Pervyj Dyen′), based on a script by his friend and long-term collaborator Andrei Konchalovsky. The film was set in 18th-century Russia during the reign of Peter the Great and starred Natalya Bondarchuk and Anatoli Papanov. To get the project approved by Goskino, Tarkovsky submitted a script that was different from the original script, omitting several scenes that were critical of the official atheism in the Soviet Union. After shooting roughly half of the film the project was stopped by Goskino after it became apparent that the film differed from the script submitted to the censors. Tarkovsky was reportedly infuriated by this interruption and destroyed most of the film. During the summer of 1979, Tarkovsky traveled to Italy, where he shot the documentary Voyage in Time together with his long-time friend Tonino Guerra. Tarkovsky returned to Italy in 1980 for an extended trip during which he and Guerra completed the script for the film Nostalghia. Tarkovsky returned to Italy in 1982 to start shooting Nostalghia. He did not return to his home country. As Mosfilm withdrew from the project, he had to complete the film with financial support provided by the Italian RAI. Tarkovsky completed the film in 1983. Nostalghia was presented at the Cannes Film Festival and won the FIPRESCI prize and the Prize of the Ecumenical Jury. Tarkovsky also shared a special prize called Grand Prix du cinéma de creation with Robert Bresson. Soviet authorities prevented the film from winning the Palme d'Or, a fact that hardened Tarkovsky's resolve to never work in the Soviet Union again. He also said: "I am not a Soviet dissident, I have no conflict with the Soviet Government." But if he returned home, he added, "I would be unemployed." In the same year, he also staged the opera Boris Godunov at the Royal Opera House in London under the musical direction of Claudio Abbado. He spent most of 1984 preparing the film The Sacrifice. At a press conference in Milan on 10 July 1984, he announced that he would never return to the Soviet Union and would remain in Europe. At that time, his son Andrei Jr. was still in the Soviet Union and not allowed to leave the country. On 28 August 1985, Tarkovsky arrived at Latina Refugee Camp in Latina, where he was registered with the serial number 13225/379. The Sacrifice was Tarkovsky's last film, dedicated to his son, Andrei Jr. Directed by Andrei Tarkovsky, which documents the making of 'The Sacrifice', was released after the filmmaker's passing in 1986. In a particularly poignant scene, writer/director Michal Leszczylowski follows Tarkovsky on a walk as he expresses his sentiments on death- he claims himself to be immortal, and has no fear of dying. During 1985, he shot the film The Sacrifice in Sweden. At the end of the year he was diagnosed with terminal lung cancer. In January 1986, he began treatment in Paris and was joined there by his son, who was finally allowed to leave the Soviet Union. The Sacrifice was presented at the Cannes Film Festival and received the Grand Prix Spécial du Jury, the FIPRESCI prize and the Prize of the Ecumenical Jury. As Tarkovsky was unable to attend due to his illness, the prizes were collected by his son, Andrei Jr. In Tarkovsky's last diary entry (15 December 1986), he wrote: "But now I have no strength left – that is the problem". The diaries are sometimes also known as Martyrolog and were published posthumously in 1989 and in English in 1991. 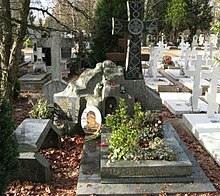 Tarkovsky died in Paris on 29 December 1986. His funeral ceremony was held at the Alexander Nevsky Cathedral. He was buried on 3 January 1987 in the Russian Cemetery in Sainte-Geneviève-des-Bois in France. The inscription on his gravestone, which was conceived by Tarkovsky's wife, Larisa Tarkovskaya, reads: To the man who saw the Angel. A conspiracy theory emerged in Russia in the early 1990s when it was alleged that Tarkovsky did not die of natural causes but was assassinated by the KGB. Evidence for this hypothesis includes testimonies by former KGB agents who claim that Viktor Chebrikov gave the order to eradicate Tarkovsky to curtail what the Soviet government and the KGB saw as anti-Soviet propaganda by Tarkovsky. Other evidence includes several memoranda that surfaced after the 1991 coup and the claim by one of Tarkovsky's doctors that his cancer could not have developed from a natural cause. As with Tarkovsky, his wife Larisa Tarkovskaya and actor Anatoli Solonitsyn all died from the very same type of lung cancer. Vladimir Sharun, sound designer in Stalker, is convinced that they were all poisoned by the chemical plant where they were shooting the film. He also wrote several screenplays. Furthermore, he directed the play Hamlet for the stage in Moscow, directed the opera Boris Godunov in London, and he directed a radio production of the short story Turnabout by William Faulkner. He also wrote Sculpting in Time, a book on film theory. Tarkovsky's first feature film was Ivan's Childhood in 1962. He then directed Andrei Rublev in 1966, Solaris in 1972, Mirror in 1975 and Stalker in 1979. The documentary Voyage in Time was produced in Italy in 1982, as was Nostalghia in 1983. His last film The Sacrifice was produced in Sweden in 1986. Tarkovsky was personally involved in writing the screenplays for all his films, sometimes with a cowriter. Tarkovsky once said that a director who realizes somebody else's screenplay without being involved in it becomes a mere illustrator, resulting in dead and monotonous films. A book of 60 photos, Instant Light, Tarkovsky Polaroids, taken by Tarkovsky in Russia and Italy between 1979 and 1984 was published in 2006. The collection was selected by Italian photographer Giovanni Chiaramonte and Tarkovsky's son Andrey A. Tarkovsky. Numerous awards were bestowed on Tarkovsky throughout his lifetime. At the Venice Film Festival he was awarded the Golden Lion for Ivan's Childhood. At the Cannes Film Festival, he won the FIPRESCI prize four times, the Prize of the Ecumenical Jury three times (more than any other director), and the Grand Prix Spécial du Jury twice. He was also nominated for the Palme d'Or two times. In 1987, the British Academy of Film and Television Arts awarded the BAFTA Award for Best Foreign Language Film to The Sacrifice. Under the influence of Glasnost and Perestroika, Tarkovsky was finally recognized in the Soviet Union in the Autumn of 1986, shortly before his death, by a retrospective of his films in Moscow. After his death, an entire issue of the film magazine Iskusstvo Kino was devoted to Tarkovsky. In their obituaries, the film committee of the Council of Ministers of the USSR and the Union of Soviet Film Makers expressed their sorrow that Tarkovsky had to spend the last years of his life in exile. Posthumously, he was awarded the Lenin Prize in 1990, one of the highest state honors in the Soviet Union. In 1989 the Andrei Tarkovsky Memorial Prize was established, with its first recipient being the Russian animator Yuriy Norshteyn. In three consecutive events, the Moscow International Film Festival awards the annual Andrei Tarkovsky Award in the years of 1993, 1995 and 1997. In 1996 the Andrei Tarkovsky Museum opened in Yuryevets, his childhood town. A minor planet, 3345 Tarkovskij, discovered by Soviet astronomer Lyudmila Georgievna Karachkina in 1982, has also been named after him. Tarkovsky has been the subject of several documentaries. Most notable is the 1988 documentary Moscow Elegy, by Russian film director Alexander Sokurov. Sokurov's own work has been heavily influenced by Tarkovsky. The film consists mostly of narration over stock footage from Tarkovsky's films. Directed by Andrei Tarkovsky is 1988 documentary film by Michal Leszczylowski, an editor of the film The Sacrifice. Film director Chris Marker produced the television documentary One Day in the Life of Andrei Arsenevich as an homage to Andrei Tarkovsky in 2000. Ingmar Bergman was quoted as saying: "Tarkovsky for me is the greatest [of us all], the one who invented a new language, true to the nature of film, as it captures life as a reflection, life as a dream". Film historian Steven Dillon says that much of subsequent film was deeply influenced by the films of Tarkovsky. At the entrance to the Gerasimov Institute of Cinematography in Moscow, Russia there is a monument that includes statues of Tarkovsky, Gennady Shpalikov and Vasily Shukshin. Concentrate (Russian: Концентрат, Konsentrat) is a never-filmed 1958 screenplay by Russian film director Andrei Tarkovsky. The screenplay is based on Tarkovsky's year in the taiga as a member of a research expedition, prior to his enrollment in film school. It's about the leader of a geological expedition, who waits for the boat that brings back the concentrates collected by the expedition. The expedition is surrounded by mystery, and its purpose is a state secret. Although some authors claim that the screenplay was filmed, according to Marina Tarkovskaya, Tarkovsky's sister (and wife of Aleksandr Gordon, a fellow student of Tarvosky during his film school years) the screenplay was never filmed. Tarkovsky wrote the screenplay during his entrance examination at the State Institute of Cinematography (VGIK) in a single sitting. He earned the highest possible grade, excellent (Russian: отлично) for this work. In 1994 fragments of the Concentrate were filmed and used in the documentary Andrei Tarkovsky's Taiga Summer by Marina Tarkovskaya and Aleksandr Gordon. Hoffmanniana (Russian: Гофманиана) is a never-filmed 1974 screenplay by Russian film director Andrei Tarkovsky. The screenplay is based on the life and work of German author E. T. A. Hoffmann. In 1974 an acquaintance from Tallinnfilm approached Tarkovsky to write a screenplay on a German theme. Tarkovsky considered Thomas Mann and E.T.A. Hoffmann, and also thought about Ibsen's Peer Gynt. In the end Tarkovsky signed a contract for a script based on the life and work of Hoffmann. Tarkovsky planned to write the script during the summer of 1974 at his dacha. Writing was not without difficulty, less than a month before the deadline he had not written a single page. He finally finished the project in late 1974 and submitted the final script to Tallinnfilm in October. Although the script was well received by the officials at Tallinnfilm, it was the consensus that no one but Tarkovsky would be able to direct it. The script was sent to Goskino in February 1976, and although approval was granted for proceeding with making the film the screenplay was never realized. In 1984, during the time of his exile in the West, Tarkovsky revisited the screenplay and made a few changes. He also considered to finally direct a film based on the screenplay but ultimately dropped this idea. Tarkovsky became a film director during the mid and late 1950s, a period referred to as the Khrushchev Thaw, during which Soviet society opened to foreign films, literature and music, among other things. This allowed Tarkovsky to see films of European, American and Japanese directors, an experience which influenced his own film making. His teacher and mentor at the film school, Mikhail Romm, allowed his students considerable freedom and emphasized the independence of the film director. Tarkovsky was, according to fellow student Shavkat Abdusalmov, fascinated by Japanese films. He was amazed by how every character on the screen is exceptional and how everyday events such as a Samurai cutting bread with his sword are elevated to something special and put into the limelight. Tarkovsky has also expressed interest in the art of Haiku and its ability to create "images in such a way that they mean nothing beyond themselves." Tarkovsky perceived that the art of cinema has only been truly mastered by very few filmmakers, stating in a 1970 interview with Naum Abramov that "they can be counted on the fingers of one hand." In 1972, Tarkovsky told film historian Leonid Kozlov his ten favorite films. The list includes: Diary of a Country Priest and Mouchette by Robert Bresson; Winter Light, Wild Strawberries, and Persona by Ingmar Bergman; Nazarín by Luis Buñuel; City Lights by Charlie Chaplin; Ugetsu by Kenji Mizoguchi; Seven Samurai by Akira Kurosawa, and Woman in the Dunes by Hiroshi Teshigahara. Among his favorite directors were Buñuel, Mizoguchi, Bergman, Bresson, Kurosawa, Michelangelo Antonioni, Jean Vigo, and Carl Theodor Dreyer. With the exception of City Lights, the list does not contain any films of the early silent era. The reason is that Tarkovsky saw film as an art as only a relatively recent phenomenon, with the early film-making forming only a prelude. The list has also no films or directors from Tarkovsky's native Russia, although he rated Soviet directors such as Boris Barnet, Sergei Parajanov and Alexander Dovzhenko highly. He said of Dovzhenko's Earth, "I have lived a lot among very simple farmers and met extraordinary people. They spread calmness, had such tact, they conveyed a feeling of dignity and displayed wisdom that I have seldom come across on such a scale. Dovzhenko had obviously understood wherein the sense of life resides. [...] This trespassing of the border between nature and mankind is an ideal place for the existence of man. Dovzhenko understood this." Although strongly opposed to commercial cinema, in a famous exception Tarkovsky praised the blockbuster film The Terminator, saying its "vision of the future and the relation between man and its destiny is pushing the frontier of cinema as an art". He was critical of the "brutality and low acting skills", but was nevertheless impressed by the film. Tarkovsky incorporated levitation scenes into several of his films, most notably Solaris. To him these scenes possess great power and are used for their photogenic value and magical inexplicability. Water, clouds, and reflections were used by him for their surreal beauty and photogenic value, as well as their symbolism, such as waves or the forms of brooks or running water. Bells and candles are also frequent symbols. These are symbols of film, sight and sound, and Tarkovsky's film frequently has themes of self-reflection. Tarkovsky developed a theory of cinema that he called "sculpting in time". By this he meant that the unique characteristic of cinema as a medium was to take our experience of time and alter it. Unedited movie footage transcribes time in real time. By using long takes and few cuts in his films, he aimed to give the viewers a sense of time passing, time lost, and the relationship of one moment in time to another. Up to, and including, his film Mirror, Tarkovsky focused his cinematic works on exploring this theory. After Mirror, he announced that he would focus his work on exploring the dramatic unities proposed by Aristotle: a concentrated action, happening in one place, within the span of a single day. Several of Tarkovsky's films have color or black and white sequences. This first occurs in the otherwise monochrome Andrei Rublev, which features a color epilogue of Rublev's authentic religious icon paintings. All of his films afterwards contain monochrome, and in Stalker's case sepia sequences, while otherwise being in color. In 1966, in an interview conducted shortly after finishing Andrei Rublev, Tarkovsky dismissed color film as a "commercial gimmick" and cast doubt on the idea that contemporary films meaningfully use color. He claimed that in everyday life one does not consciously notice colors most of the time, and that color should therefore be used in film mainly to emphasize certain moments, but not all the time, as this distracts the viewer. To him, films in color were like moving paintings or photographs, which are too beautiful to be a realistic depiction of life. Contrarily, however, Bergman conceded the truth in the claim made by a critic who wrote that, "with Autumn Sonata Bergman does Bergman," adding, "Tarkovsky began to make Tarkovsky films, and that Fellini began to make Fellini films [...] Buñuel nearly always made Buñuel films." This pastiche of one's own work has been derogatorily termed as "self-karaoke." Tarkovsky worked in close collaboration with cinematographer Vadim Yusov from 1958 to 1972, and much of the visual style of Tarkovsky's films can be attributed to this collaboration. Tarkovsky would spend two days preparing for Yusov to film a single long take, and due to the preparation, usually only a single take was needed. In his last film, The Sacrifice, Tarkovsky worked with cinematographer Sven Nykvist, who had worked on many films with director Ingmar Bergman. (Nykvist was not alone: several people involved in the production had previously collaborated with Bergman, notably lead actor Erland Josephson, who had also acted for Tarkovsky in Nostalghia.) Nykvist complained that Tarkovsky would frequently look through the camera and even direct actors through it. Voyage in Time (1983): documents the travels in Italy of Andrei Tarkovsky in preparation for the making of his film Nostalghia, Tonino Guerra. Auf der Suche nach der verlorenen Zeit (1988): Andrej Tarkowskijs Exil und Tod. Documentary directed by Ebbo Demant. Germany. ^ Schrader, Paul (2018). Transcendental Style in Film: Ozu, Bresson, Dreyer. University of California Press. ^ Maya Turovskaya. "7 с 1/2 и Фильмы Андрея Тарковского". Archived from the original on 19 July 2013. ^ Sipatova, Marina (2007). Тайна рода Тарковских. Moskovskij Komsomolets (in Russian). Retrieved 25 November 2007. ^ Green, Peter (1993). Andrei Tarkovsky: The Winding Quest. Springer. p. 2. ISBN 978-1349119967. ^ Volkov, Solomon (2009). The Magical Chorus: A History of Russian Culture from Tolstoy to Solzhenitsyn. Vintage Books. p. 230. ISBN 978-1400077861. ^ a b Pleshakova, Anastasia (4 April 2007). "Тарковский был "разрешенным контрреволюционером"" [Tarkovsky was "a legal сounterrevolutionary"]. Komsomolskaya Pravda. Archived from the original on 4 January 2008. Retrieved 27 November 2007. ^ Gianvito, John (2006). Andrei Tarkovsky: Interviews (Conversations with Filmmakers Series). University Press of Mississippi. pp. XXV. ISBN 978-1-57806-220-1. ^ Marshall, Herbert. Sight and Sound. Vol 45, no 2. Spring 1976. p. 93. ^ Tarkovsky, Andrei; translated by Kitty Hunter-Blair (1991). Time Within Time: The Diaries 1970-1986. Calcutta: Seagull Books. ISBN 978-81-7046-083-1. ^ a b Мир и фильмы Андрея Тарковского. Сост. А. Сандлер. [Andey Tarkovsky's world and films] (in Russian). Moscow: Iskusstvo(Искусство). 1990. ISBN 978-81-7046-083-1. ^ Wagstaff, Peter (2004). Border crossings: mapping identities in modern Europe. Peter Lang. p. 169. ISBN 978-3-03910-279-2. Retrieved 7 March 2011. ^ Goodman, Walter. "ANDREI TARKOVSKY, DIRECTOR AND SOVIET EMIGRE, DIES AT 54". Retrieved 19 November 2018. ^ Custodero, Alberto (10 December 2015). "Latina, quei profughi dell'Est dimenticati. E spunta la scheda di Tarkovskij". La Repubblica. ^ "Campo profughi a Latina, la scheda ritrovata di Tarkovskij. Documenti, foto e testimonianze". La Repubblica. 8 December 2015. ^ Komsolmoskaya Pravda, "New Tarkovsky documents surface", 15. September 1995, page 23. ^ Tyrkin, Stas (23 March 2001). "In Stalker Tarkovsky foretold Chernobyl". Komsomolskaya Pravda. Archived from the original on 8 October 2009. Retrieved 9 September 2009. ^ Tarkovsky, Andrei (1990). "Lectures on Film Directing (notes from classes taught by Tarkovsky at the State Institute of Cinematography)". Iskusstvo Kino. Retrieved 14 January 2008. ^ Illg, Jerzy (1987). "Z Andriejem Tarkowskim rozmawiają Jerzy Illg, Leonard Neuger". Res Publica. 1: 137–160. Archived from the original on 16 January 2008. Retrieved 16 January 2008. ^ Tarkovsky, Andrei (2006). Chiaramonte, Giovanni; Tarkovsky, Andrey A. (eds.). Instant Light, Tarkovsky Polaroids. Thames and Hudson. ISBN 9780500286142. ^ "Obituary". Literaturnaya Gazeta. 7 January 1987. ^ "МУЗЕЙ А.ТАРКОВСКОГО". Archived from the original on 8 July 2007. Retrieved 30 November 2007. ^ Schmadel, Lutz (2003). Dictionary of Minor Planet Names. Springer. ISBN 978-3-540-00238-3. ^ "Significant Documentaries". Archived from the original on 15 January 2008. Retrieved 15 January 2008. ^ Dillon, Steven (2006). The Solaris Effect: Art and Artifice in Contemporary American Film. University of Texas Press. ISBN 978-0-292-71345-1. ^ "Panoramio - Photo of Monument to Gerasimov Institute of Cinematography famous learner - Gennady Shpalikov, Andrei Tarkovsky and Vasily Shukshin". panoramio.com. Retrieved 27 November 2017. ^ Turovskaya, Maya (1989). Tarkovsky: Cinema as Poetry. London: Faber and Faber. ISBN 978-0-571-14709-0. Archived from the original on 12 June 2009. Retrieved 30 December 2014. ^ Blasco, Gonzalo (10 November 2003). "An Interview with Marina Tarkovskaia and Alexander Gordon". andreitarkovski.org. Retrieved 10 December 2007. ^ Abdusalamov, Shavkat; translated by Sergei Sossinsky (1990). Feedback Effects, in About Andrei Tarkovsky, Memoirs and Biographies. Moscow: Progress Publishers. ISBN 978-5-01-001973-0. ^ Tarkovsky, Andrei. Sculpting in Time. Trans. Kitty Hunter-Blair. Austin, Texas: University of Texas Press, 2003. ^ Gamble, Patrick (27 October 2015). "10 great films that inspired Andrei Tarkovsky". BFI. British Film Institute. Retrieved 20 July 2016. ^ Lasica, Tom (March 1993). "Tarkovsky's Choice". Sight and Sound. 3 (3). Archived from the original on 6 July 2009. Retrieved 25 December 2007. ^ Gianvito 2006, p. 42–43. ^ Gianvito 2006, p. 5. ^ de Brantes, Charles (20 June 1986). "La foi est la seule chose qui puisse sauver l'homme". La France Catholique. Retrieved 14 January 2008. ^ "English Programme Booklet for The Sacrifice" (Press release). Swedish Film Institute. Retrieved 14 January 2008. ^ Chugunova, Maria (December 1966). "On Cinema – Interview with Tarkovsky". To the Screen. Archived from the original on 27 May 2009. Retrieved 14 January 2008. ^ Bielawski, Trond Trondsen and Jan. "Nostalghia.com - An Andrei Tarkovsky Information Site". nostalghia.com. Retrieved 11 March 2018. ^ "Ingmar Bergman Evaluates His Fellow Filmmakers — the "Affected" Godard, "Infantile" Hitchcock & Sublime Tarkovsky". ^ a b The films of Andrei Tarkovsky: a visual fugue By Vida T. Johnson, Graham Petrie, p. 79. Dunne, Nathan (2008). Tarkovsky. Black Dog Publishing. ISBN 978-1-906155-04-9. Gianvito, John, ed. (2006). Andrei Tarkovsky: Interviews (Conversations with Filmmakers Series). University Press of Mississippi. ISBN 978-1-57806-220-1. Le Fanu, Mark (1987). The Cinema of Andrei Tarkovsky. British Film Institute. Johnston, Vida T.; Petrie, Graham (1997). The Films of Andrei Tarkovsky: A Visual Fugue. Bloomington: Indiana Univ. Press. ISBN 978-0-253-20887-3. Martin, Sean (2005). Andrei Tarkovsky. Pocket Essentials. ISBN 978-1-904048-49-7. Jónsson, Gunnlaugur A.; Óttarsson, Thorkell Á. (2006). Through the Mirror: Reflections on the Films of Andrei Tarkovsky. Cambridge Scholars Press. ISBN 978-1-904303-11-4.
revue NUNC (ed.). "Dossier Andrei Tarkovsky". n°11, 2006. Editions de Corlevour. Tarkovsky, Andrei (1989). Sculpting in Time. University of Texas Press. ISBN 978-0-292-77624-1. Slevin, Tom (2010). "Existence, Ethics and Death in Andrei Tarkovsky's cinema: the cultural philosophy of Solaris". Film International. 8 (2): 49–62. doi:10.1386/fiin.8.2.49. Tejeda, Carlos (2010). Andrei Tarkovski. Cátedra, Madrid. ISBN 978-84-376-2666-6. Elmanovitš, Tatjana (1980). Ajapeegel. Andrei Tarkovski filmid (in Estonian). Eesti Raamat. Turovskaya, Maya (1991). 7½ ili Filmõ Andreya Tarkovskovo (in Russian). Iskusstvo. Alexander-Garrett, Layla (2011). Andrei Tarkovsky: A Photographic Chronicle of the Making of The Sacrifice (in English and Russian). Cygnnet. ISBN 978-09-570-4160-8. Archived from the original on 12 November 2012. Wikimedia Commons has media related to Andrej Tarkovskij.